Successfully Added 7-Inch TFT LCD Monitor - 16:9 Aspect Ratio, 800x480p, Energy Efficient, 128GB SD Card Support to your Shopping Cart. 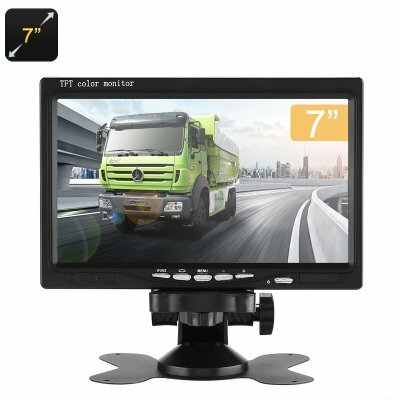 This 7-Inch TFT LCD monitor is a great car accessory that can be hooked up to your car DVR in order to get a clear overview of all that’s happening around your vehicle. When used together with your rear view parking camera, this car gadget shows you what’s going on behind your vehicle without you needing to turn your head. This brings along great efficiency and increases your safety on the road while driving or parking your car in reverse. With this 7-Inch TFT LCD monitor at your side, everybody will be able to park their car without running into any tasty surprises. The car gadget itself is easy to install and use. Simply place it on your dashboard, connect it to your camera, and you’ll be all set to go. Crafted out of durable ABS material, this car monitor features a strong and high-end design. This gives it a stylish look for in your car – making it a real upgrade for your vehicle. Additionally, it is energy efficient which is great for both your wallet and the environment. With its 800x480p resolution, it treats you with clear and detailed images in a widescreen 16:9 aspect ratio. Therefore, you can be guaranteed that not the slightest detail stays unnoticed when this TFT LCD monitor is hooked up to your parking camera. It supports the input of a 128GB SD card that allows you to instantly store images and footage snapped with your car DVR. This means that, in the case of an unfortunate accident, your car gadget will always provide you with the stored footage of what happened at that particular moment. Thanks to this, you’ll never run into false insurance claims again.